Puppy Obedience Training At Its Best! Giving your puppy obedience training doesn't necessarily mean he's a naughty puppy (although it will work wonders if he is!) it's simply a way of teaching your new little boy how to behave well. So, if you'd like a well-mannered Cocker Spaniel (and who wouldn't?) read on to learn how best to achieve it. 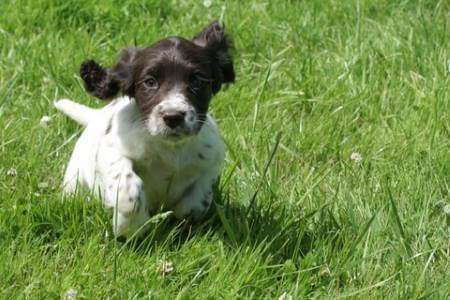 Puppy obedience training is one of the first stages in dog training and it's your first step towards a well-behaved Cocker Spaniel puppy. My aim is to give you the tools (and the confidence) to teach your Cocker puppy to listen to your every word and to respond to your requests, willingly and quickly. After reading this article you will be able to teach your puppy basic obedience commands, such as sit, down, come, stay, and a few more besides. Puppy obedience training is easy, but it can be frustrating at times if your pup doesn't 'get it' right away. I recommend you read these training tips before you go any further to help you get the best out of the following obedience training. Keep your sessions short, frequent and most of all, make them fun! Good luck and enjoy yourselves. This is a very useful command. Obedience training gave this puppy great manners! 'Watch Me' will not only teach your puppy to look at you, but will also teach him to pay attention, ignoring everything else around him. Use this command and get his full attention. Once learned, it can help to make all other puppy training so much easier for you both. Use it before beginning his training exercises and it will help you to teach him more quickly because he's much more likely to respond to your commands when he's paying attention and listening to you! If you'd like to learn how to teach your puppy to 'Watch Me!' and get his full attention whenever you need it, just follow the link. Out of all the puppy obedience training commands, this is probably one of the most important you'll ever teach your little guy because at some point you may need to get him out of danger. This recall command may even save his life! Getting your puppy to come back to you can sometimes be tricky, especially outdoors because there are so many distractions, but with a little patience and persistence he'll soon get the hang of it. Once he's grasped the basics of this lesson, you'll need to make sure you repeat this command in lots of different places and situations. For example, it's fairly easy to get your puppy to come to you when you're indoors and you've a tasty treat in your hand, especially if he can see or smell it. Calling him to you when he's playing with his favorite toy, and you've nothing better to offer him, well that's an entirely different matter! At first your puppy may take a little while come to you, and he'll probably have a few stops along the way, but so long as he's making his way back to you, that's fine. Your ultimate goal is to get him to come to you when you call him. This is probably one of the easiest lessons to teach your puppy, and it's such a useful exercise because you'll use it in so many different situations. What an obedient little puppy! For example, I always ask Max to sit while I put on his collar and lead before taking him for a walk. And he understands that before he's allowed to eat his dinner he must be sitting quietly by his bowl and wait until I let him know he can eat, otherwise, no dinner. Now I no longer need to give the command; when it's time to put on his collar, or feed him, he sits automatically. I also ask him to sit down before I open the front door to visitors, and again I no longer need to give the command, he just does it. 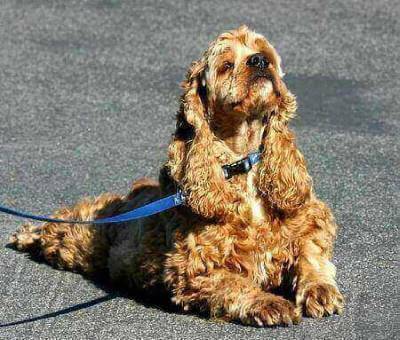 These are a few good disciplines to adopt for your pet, (there are more) and apart from putting your Cocker Spaniel into a calm, relaxed state, the 'Sit' command will help to reinforce your place as his pack leader. The last thing any dog owner wants is an over-excited puppy jumping up at anyone who visits their home! The 'Down' command will calm your dog. And the same applies to when you meet people in the street! This is where the 'Down' command can help to keep your puppy calm and quiet, and it's especially useful to use if there are young excited children around. Putting your dog into this position not only helps to stop him from becoming over-excited, it's calming effect could also help stop him from knocking over a young child! When your dog is in the down position, he's relaxed, calm and submissive. There will be many times when you want your puppy to stand up for you, for example, while grooming him, giving him a bath, or while he's being checked over by his vet. Your Cocker will also need to learn to 'Stand' when you ask him to, especially if you intend to take him to dog obedience and socialization classes, or if you plan to show him when he's older, so it's well worth teaching him this command. At first, you might think it's cute when your pup barks at someone, but it can quickly become a nuisance if it continues or it becomes a habit, no matter how sweet he is! If a barking puppy is ignored (or worse, encouraged), you may find it very difficult to stop him when's he's older because he will now be barking simply out of habit. Besides which, it's not good manners! One of the easiest ways to stop your puppy barking is to teach him the "Be Quiet" command. 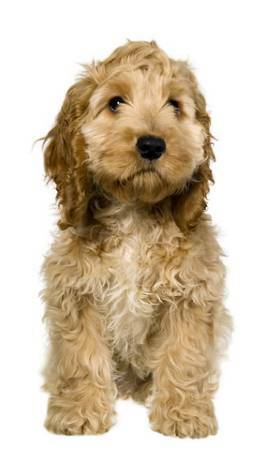 Now this may sound contradictory, but the idea is to train your puppy to bark and then teach him to stop barking...a quiet Cocker Spaniel guaranteed! I really don't recommend you encourage your puppy to bark...unless of course, you're going to teach him this command. Wait and Stay are actually two different commands and can be used in different situations. It's important that you understand the difference between the two before you teach your puppy either of these commands, if you decide to use both. I explain the differences here, and explain how to teach your puppy both 'Wait' and 'Stay' commands. If you prefer to teach your Cocker Spaniel only one of these commands, you could simply use either one for all situations. It's your choice. You've just come through the door, laden down with shopping, your puppy is jumping around your feet and you almost trip over him. My Cocker Spaniel Max waiting for his next instruction! There will be many times when you just need your puppy to lie down and stay where he is until you're able to make a fuss of him or see to his needs. Without sounding too obvious, this command is simply a combination of two commands. The 'Down and Stay' command is very useful when your dog is unnecessarily boisterous or being a little pushing and is demanding too much attention! It goes without saying that your pup must have mastered both the 'Down' and 'Stay' commands separately before you try and teach him this one. As is their nature, puppies are into everything, and it's possible that your Cocker Spaniel puppy may pick up something unpleasant, something that you really don't want him to eat. So with a curious puppy in the house, you really shouldn't be surprised at how much you'll use this command. Let me give you an example of when you might want to use this command. You're on a walk with your Cocker Spaniel when he sniffs out a dead and decomposing rabbit or something equally unpleasant, something which you wouldn't want him to touch let alone eat or roll in, which of course he'll almost certainly try to do! If you've successfully taught him the 'Leave It!' command when he was a puppy, you can be confident that he won't go near it and he'll continue on his walk with you. If it's too late to use the 'leave it' command, (ie it's already in his mouth!) then this is the command to use. And if he ever manages to get his paws on a bar of chocolate, (Easter-time is a particular problem with all those yummy chocolate eggs lying around!) you need to be able to get him to drop it immediately. Chocolate is especially toxic to puppies and it wouldn't take much to make him very ill indeed. It's a really good idea to teach your puppy the "Drop It!" command as early as possible and help keep him safe from harm! 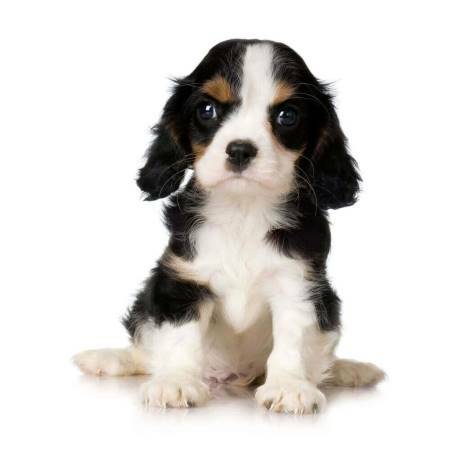 I hope you've enjoyed teaching your new pet these puppy obedience training commands and that you're well on your way to having a happy, well-mannered little Cocker Spaniel puppy! Letting off steam after obedience classes! But training puppies doesn't, and shouldn't stop here. 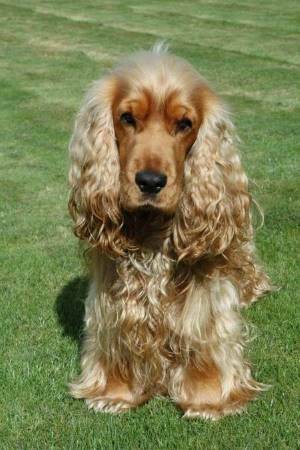 Your Cocker Spaniel will mature and eventually become an older dog but that doesn't mean his training should become a thing of the past. I'm sure you've heard the saying, 'Use it or lose it', well the same applies here too and all dog obedience training should be continued and reinforced throughout your pet's life to help make sure his manners don't slip! To help lighten up a little, you might like to take a break from training and teach your puppy some cool games, just follow the link for details.